BREAKING: December 4, 2018: This or next week the U.S. House is scheduled to consider its upcoming 2019 appropriations bill. Several news sources have indicated that the Israel Anti-Boycott Act (HR 1697/S. 720) might be “buried” in that bill. Urge your members of Congress and members of the House and Senate appropriations committees to oppose sneaking in this anti-free speech bill in any federal government funding package. There is equal concern that this bill could possibly move in the U.S. Senate. CAIR and other civil rights organizations say that proposed legislation would violate the constitutionally-guaranteed free speech rights of American business owners and individuals who participate in the international boycott of Israel's illegal occupation of Palestine territories. Boycotts such as the Montgomery Bus boycott against segregation or the boycott of companies enabling South African Apartheid have been employed successfully in support of civil and human rights and as an integral part of our political process. directed by the United Nations, the European Union or any other international governmental organization that is aimed at Israel's illegal occupation of Palestine territories with criminal penalties resulting in up to 20 years in prison and a $1 million fine. Responding to public backlash over the bill curbing the free speech rights of Americans, Senator Cardin has stated that he is open to amending the legislation and other congressional co-sponsors are now re-examining or withdrawing their support for the act. However, CAIR believes that no amendment can be offered to fix the legislation’s true purpose – to intimidate Americans from supporting the Boycott, Divestment, and Sanctions (BDS) movement of Israel's illegal occupation of Palestine territories. CAIR believes that American involvement in foreign boycotts started with throwing tea in Boston Harbor. It is un-American and illegal for the U.S. Government to deny U.S. businesses and persons the right to work to change the illegal and discriminatory actions of a foreign government. BDS is a nonviolent movement initiated by Palestinian civil society and has earned backing from leaders of conscience like Archbishop Desmond Tutu, Nobel Peace Prize winner and chairman of the post-Apartheid Truth and Reconciliation Commission in South Africa. The Intercept reports that “some co-sponsors seemed not to have any idea what they co-sponsored” and have “no idea” that it contains criminal penalties. The push to pass this legislation in Congress mirrors the larger nationwide state legislative effort to condemn business and academic boycotts of illegal occupation in Palestine. 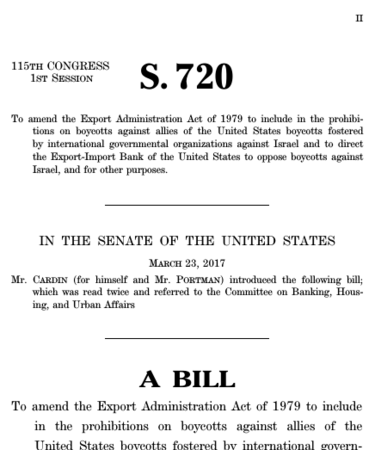 Implementation of the bill would encourage U.S. government retaliation against the growing number of businesses, major church denominations, charitable foundations, university student governments, labor unions, and investors who have called to boycott or take other economic measures against companies and institutions complicit in Israel’s human rights abuses.